We at Dr Kandhari’s Skin and Dental Clinic located in Greater Kailash 1, New Delhi provide an in house doctor / Orthodontist in Delhi for dental braces treatment. Our treatment concept has always been, face-driven orthodontics as we concentrate on maximizing the effect of the treatment on the entire face and not just the teeth. The end result is a well balanced harmonious smile. Dr. Priyanka Basu, our clinician /orthodontist places “face-driven orthodontics” as her primary treatment goal. She takes the time to assess you as a unique individual and will tailor your treatment plan to best suit your requirements. Our specialist Orthodontist has the experience and knowledge to successfully treat some of the most complex cases. We offer a wide range of orthodontic treatments that aim to correct every possible problem including gaps, crooked and rotated teeth, overbites, cross bites, open bites and crowding. 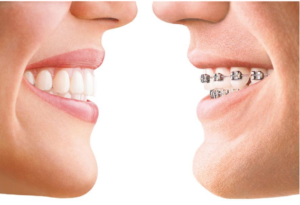 Due to our expertise we can offer every type of orthodontic treatment currently available in India and overseas, which include fast acting braces, cosmetic teeth alignment , invisible / cosmetic clear braces, Incognito lingual braces, Damon braces , fixed metal or ceramic braces , myobrace and ortho trainers.